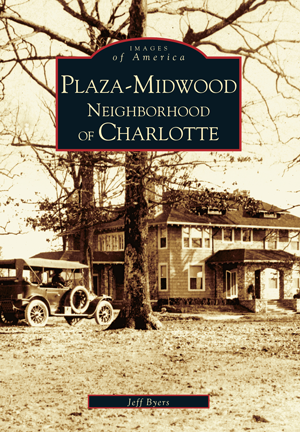 One of Charlotte's early streetcar suburbs, the Plaza-Midwood neighborhood epitomizes the New South vision of Charlotte. Its history reflects the growing of the New South and the nation as a whole. Plaza-Midwood, known for its architectural and social diversity, has been through the years a proposed enclave for Charlotte's New South elite, an "at risk" inner city area, and ultimately an urban success story. Plaza-Midwood's current prosperity can be attributed to the strength and vision of its "citizens," who continue to preserve the character and history of their community. Plaza-Midwood owes its survival to a dedicated neighborhood organization. Through their efforts, much of the area has been declared an historic district. Author Jeff Byers lives in Plaza-Midwood and is a member of its neighborhood association. His goal is to help preserve the history of this diverse neighborhood and further explore Charlotte's past. He credits Plaza-Midwood's community spirit for this project's success. Jeff has a B.A. in history from UNC Charlotte and is a member of the Levine Museum of the New South.